The design that is created by the Scandinavian spruce slats is a timeless arrangement that has been used in interior design for more than a century. The design that is created by the Scandinavian spruce slats is a timeless arrangement that has been used in interior design for more than a century. This impressive shoji screen features a contemporary and attractive design that will fit into any decorative scheme. Use it to create a private space while enhancing the appearance of any room. 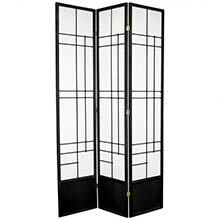 Made from Scandinavian spruce and pressed pulp rice paper for the finest quality look and feel, the Hinaga screen is one of our best 84" sellers. An added kick plate at the bottom of the screen prevents scuff marks and adds stability to the piece.